You should now have a directory called msmc-tools in your home-folder, as you can verify by running ls. All input data and intermediate files for this tutorial are at ~/share/MSMC-tutorial-files/. For this lesson, we will use two trios from the 69 Genomes dataset by Complete Genomics. You will find the so called “MasterVarBeta” files for six individuals for chromosome 1 in the cg_data subdirectory in the tutorial files. Some information on the six samples: The first three form a father-mother-child trio from the West-African Yoruba, a people living in Nigeria. Here, NA19240 is the offspring, and NA19238 and NA19239 are the two parents. The second three samples form a father-mother-child trio from Utah (USA), with European ancestry. Here, NA12878 is the offspring, and NA12891 and NA12892 are the parents. Here, we restrict analysis only on chromosome 1 (which is called chr1 in the Complete Genomics data sets). Normally, you would also loop over chromosomes 1-22 in this script. The line MASTERVAR=$(ls ...) uses bash command substitution to look for the masterVar file and store the result in the variable $MASTERVAR. Copy the code above into a shell script, named for example runCGcaller.sh , adjust the paths, make it executable via chmod u+x runCGcaller.sh and run it. You should see log messages indicating the currently processed position in the chromosome. Chromosome 1 has about 250 million sites, so you can estimate the waiting time. When finished (should take 10-20 minutes for all 6 samples), you should now have one *.mask.bed.gz and one *.vcf.gz file for each individual. which gives a very detailed view on which regions could be called (2nd and 3rd column are begin and end). There is one more mask that we need, which is the mappability mask. This mask defines regions in the reference genome in which we trust the mapping to be of high quality because the reference sequence is unique in that area. The mappability mask for chromosome 1 for the human reference GRCh37 is included in the Tutorial files. For all other chromosomes, this README includes a link to download them, but we won’t need them in this tutorial. Here we have added the mask and VCF file of the NA12878 sample, and the mappability mask. I suggest you don’t actually run this because we won’t need this single-sample processing. Here we have first input all 6 calling masks, plus one mappability mask, then the two trio specifications (see ~/msmc-tools/generate_multihetsep.py -h for details), and then the 6 VCF files. MSMC’s purpose is to estimate coalescence rates between haplotypes through time. This can then be interpreted for example as the inverse effective population size through time. If the coalescence rate is estimated between subpopulations, another interpretation would be how separated the two populations became through time. In this tutorial, we will use both interpretations. Let’s go through the parameters one by one. The -p 1*2+15*1+1*2 option defines the time segment patterning. By default, MSMC uses 32 time segments, grouped as 1*2+25*1+1*2+1*3, which means that the first 2 segments are joined (forcing the coalescence rate to be the same in both segments), then 25 segments each with their own rate, and then again two groups of 2 and 3, respectively. 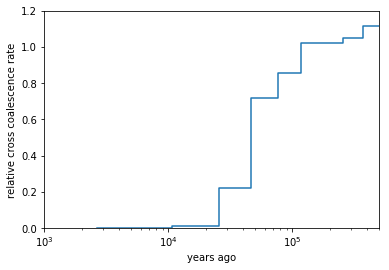 MSMC2 run time and memory usage scales quadratically with the number of time segments. Here, since we are only analysing a single chromosome, you should reduce the number of segments to avoid overfitting. That’s why I set 18 segments, with two groups in the front and back. Grouping helps avoiding overfitting, as it reduces the number of free parameters. The -I option denotes the 0-based indices of the haplotypes analysed. In our case we have 8 haplotypes, the first four being of European ancestry, the latter of African ancestry. In the first run we estimate coalescence rates within the European chromosomes (indices 0,1,2,3), and in the second case within the African chromosomes (indices 4,5,6,7). The last argument to msmc2 is the multihetsep file. Normally you would run it on all 22 chromosomes, and in that case you would simply give all those 22 files in a row. On one processors, each of those runs will take about one hour, so that’s too long to actually run it, but you should at least test whether it starts alright and then kill the job using CTRL-C. The output files of the runs are available in the tutorial files. Here, I am running on all pairs between the first two parental chromosomes in each subpopulation, so -I 0-4,0-5,1-4,1-5. If you wanted to analyse all eight haplotypes (will take consiberably longer), you would have had to type -I 0-4,0-5,0-6,0-7,1-4,1-5,1-6,1-7,2-4,2-5,2-6,2-7,3-4,3-5,3-6,3-7.
where you can see that the separation of (West-African) and European ancestors began already 200,000 years ago. The two populations then became progressively more separated over time, reaching a mid-point of 0.5 around 80,000 years ago. Since about 45,000 years, the two population seem fully separated on this plot. 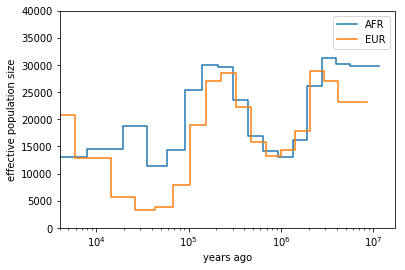 Note that even in simulations with a sharp separation, MSMC would not produce an infinitely sharp separation curve, but introduces a “smear” around the true separation time, so this plot is compatible also with the assumption that the two populations where already fully separated around 60,000 years ago, even though the relative cross-coalescence rate is not zero at that point yet.